This week, the pro-Kremlin media stated that the British government was behind the Skripal case, the West is meddling in Belarus, the US is conducting dangerous experiments in Ukraine and – as usual – Ukraine is the provocateur, like reported by euvsdisinfo.eu. What kind of a picture could one paint about Ukraine? At least six pro-Kremlin outlets have been busy creating the image of a dangerous and unpredictable country, by claiming that an Italian journalist went missing in eastern Ukraine. In reality, the journalist is safely back in Italy and now sharing vivid images captured in the government-controlled sector of Mariupol. Continuing with Ukraine – after the Foreign Minister announced his country is preparing to terminate 50 treaties with Russia, the pro-Kremlin media turned up its sleeves and got to work spreading disinformation about Ukrainian politicians supposedly trying to show the results of their work to their master – the USA. Looking at pro-Kremlin media week by week, the will to undermine the credibility of approaching elections and of politicians in Ukraine with claims of dependence to US is pre-eminent. In addition to Ukraine, the “working for the American master” narrative was also applied to Germany. Russian state media announced that Germany has only limited sovereignty, as its foreign and military policy is conducted under the watchful eye of Washington. This distorted theory fits nicely next to older pro-Kremlin claims such as that Germany is the executor of US hegemony over Europe; the USA is controlling Europe through occupied Germany and Germany will have to choose between defending Europe’s interest and catering to Washington. But who controls the puppet master? To answer this question, we have to dive deeper. We heard claims that the New York Times and the Washington Post are serving the interests of the US military industry. The reasoning of the conspiracy theorists’ goes as follows: the American mass media is attacking and thus manipulating President Trump; the real puppet masters are former generals advising financial corporations and the mass media. For those who aim to discredit the Western media, let’s reflect on the fact that according to 2018 World Press Freedom Index by Reporters Without Borders, Russia ranked 148 out of 180. The US is in 45th place. The US is in the Kremlin’s crosshairs also for allegedly taking foreigners as hostages. In reality, Konstantin Yaroshenko was detained for drug-smuggling, Natalya Veselnitskaya was indicted for obstruction of justice and Maria Butina pleaded guilty to conspiring against the US. 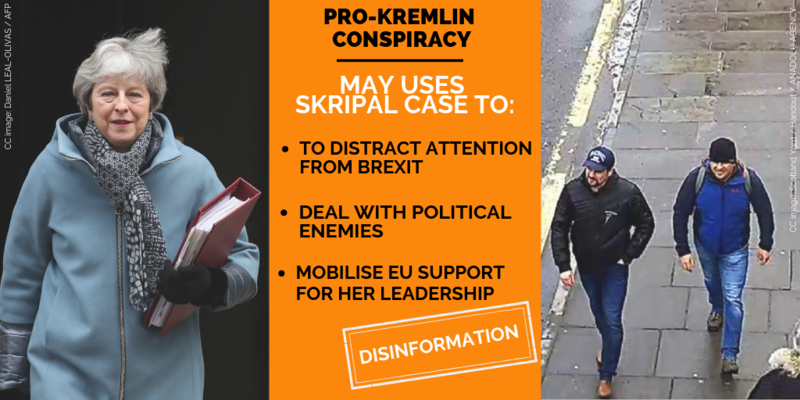 By March last year EUvsDisinfo had already collected 20 different narratives about the Skripal case; by last week it had catalogued over 100 disinformation messages around the Salisbury attack. But after the EU’s decision to impose sanctions on the GRU officials linked to the Skripal poisoning, even more new narratives have surfaced. According to pro-Kremlin outlets UK Prime Minister Theresa May was behind the EU’s decision to impose sanctions and this is her way to remind British politicians that they are all part of the conspiracy. No evidence supports these claims, of course; on the contrary there is overwhelming and internationally backed evidence collected by the British Police that demonstrates a solid chain of events, with pictures, connecting the suspects to the locations in the case. The investigation is still ongoing but parts of the material have been released to the public. The second pro-Kremlin narrative from last week about the Skripals was not completely developed; instead it was presented as a question about the extremely unlikely coincidence that an army colonel and chief nursing officer was amongst the first people to arrive at the scene of their poisoning. As the ever expanding number of contradictory theories about the Skripal case suggests, the strategic aim here is to confuse audiences, not to convince them about a single narrative.